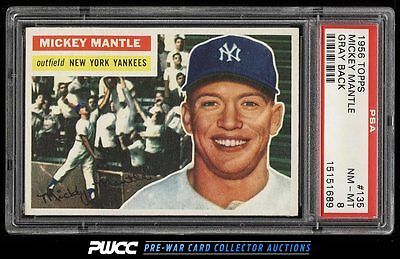 A dead centered, truly exceptional '56 Mantle which far outshines nearly all other PSA 8s in the hobby. Wonderfully bright and fresh example boasting four sharp corners and crisp edges throughout. Easily the best PSA 8 we've brokered in recent times and comes with our highest recommendation. One of nearly 20,000 cards, lots, and sets up for bid in our 7th Auction of 2016. Click on the link above to view the other PWCC auction lots.